When The Guide started back in the 1980s, our biggest challenge was getting in to see schools that had never heard of us. Many were understandably reluctant to allow visits and some writers had to resort to subterfuge (posing as prospective parents) to get a look round. Those days are long gone, thank goodness, and schools are now extremely welcoming. But very, very occasionally we find that heads still come over all coy and can’t spare us time for an interview. The head’s profile is a key part of our reviews – parents really value it and we hear on the grapevine that heads themselves enjoy finding out what we have to say about their peers. So, if a writer can’t meet a head at first hand then ingenuity may be called for. Public events such as open days are a good opportunity for head watching (and listening) and a chance to meet other teachers and pupils. They can also, at a stretch, provide enough material for at least a sketch of a school’s elusive leader, if not a full portrait. While non-talking heads are thankfully a bit of a rarity, the same cannot be said of marketing and publicity material. It’s almost impossible to imagine now, but only a generation ago all correspondence with schools would have been by post or telephone. There were no websites or internet forums; parents had to request a prospectus to be sent and if there were colour photos they’d consider themselves lucky. Today’s prospective parents risk hernias as they struggle to their cars under the weight of thick, glossy publications, beautifully produced school magazines and branded merchandise such as tote bags, mugs, pens, even chocolate. It’s the same for Good Schools Guide writers, most of whom end up with a car boot full of more bags bearing different school logos than it would ever be possible to have children. Being shown round a school by pupils is always one of the best bits of a review visit. Yes, we know tour guides are hand-picked and it’s unlikely that the class clown or bitter cynic is going to be accompanying you, but it’s still great to get a pupil’s eye view. There are downsides, albeit charming ones. Primary and prep school pupils, in particular, tend to be thorough in the extreme, and you will be on first name terms with every obscure cupboard and cloakroom by the time you arrive, exhausted, back at reception. Running up and down staircases behind light-footed ten-year-olds can also be a bit wearing on the legs, ditto keeping up with unfeasibly long-limbed housemasters – and all this while trying to scribble everything down in a notebook. No wonder choice of footwear is crucial. Shoes need to be smart enough for the head’s study, athletic enough to help propel the wearer up endless flights of stairs, and robust enough to withstand trekking over a rugby pitch in the rain. Lunch is a welcome chance to sit down, but the notebook stays out so it’s better to choose something that can be eaten with just a fork! Freshly baked bread, international cuisine and salad bars - we’ve even tucked into moules marinière at one prep school - so far, so gastro, but pupils’ favourites are still the good old Wednesday roast and Friday fish and chips. Each month the Good Schools Guide Newsletter chooses a brand-new book that we think children will enjoy. Meg Rosoff is best known for her award-winning young adult novel, How I Live Now, which was made into a film starring Saoirse Ronan. But McTavish Goes Wild, her latest book, is aimed at younger readers. 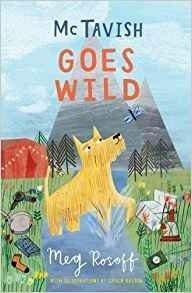 It’s the second in her series about a rescue dog called McTavish and his mission to sort his chaotic new family out. This time round the Peachey family is setting off on a camping holiday, as disunited and argumentative as ever. Pa Peachey is terrified of the hidden dangers lurking in the great outdoors, elder daughter Ava wants to stay at home and read German philosophy and son Ollie is desperate to know if the campsite has a disco (no Ollie, it doesn’t). McTavish Goes Wild is beautifully written and very funny, but more importantly it features a heart-warming message too. With gorgeous illustrations by Grace Easton and tips on how to makes the most of the countryside, this short novel will charm children and parents alike. Barrington Stoke is a leading publisher of dyslexia-friendly books and books for reluctant readers and we can’t think of anyone who won’t enjoy this. Virtuoso Lauren. Congratulations to 16-year-old pianist Lauren Zhang, the winner of this year’s prestigious BBC Young Musician Award. Lauren is a pupil at King Edward VI High School for Girls in Birmingham. Days after her victory she was back at school sitting her GCSE exams. Impressive indeed. Young entrepreneurs. Following in the illustrious footsteps of Cath Kidston, Anya Hindmarch, Johnny Boden, David Ross and Nick Wheeler, Annoushka Ducas, the co-founder of Links of London and the jewellery brand Annoushka, will be inspiring budding young entrepreneurs at Milton Abbey School in Dorset to follow in her footsteps. The school has announced that she will be its Entrepreneur in Residence for the next academic year. Happy teachers. Teachers and teaching assistants are happier, more committed and more content in their jobs than people working in other professions. That’s the verdict of new research by the Institute of Education and the National Institute of Economic and Social Research anyway. Mental health. Data obtained by the NSPCC shows a sharp rise in the number of children under the age of 11 referred for mental health treatment by schools in the last four years. The youngest child referred for help was only three. Farewell to pencil cases. St Wilfrid’s Primary School in Blyth, Northumberland has banned pencil cases from the classroom to avoid pupils from poor families being stigmatised. The school has also introduced plain school bags to avoid pupils envying each other’s belongings. The Good Schools Guide has launched a dedicated SEN newsletter which highlights the schools for SEN which have impressed us; SEN school news – expansions, head moves, newly released Ofsted reports and so on; resources for parents of children with SEN; forthcoming events; news; and our own forthright views. Subject to our Terms and Conditions. (No, we will not sell you or yours to anyone).